We’re exploring how growth and development could happen in a meaningful way for the Dalhousie Co-op location. If you live, work, play or travel in the area, we want to hear from you. Co-op, in conjunction with Quarry Bay Developments proposed a combined development permit and land use redesignation (re-zoning) for the site located at 5505 Shaganappi Trail N.W. (the existing Co-op site). The final development plan proposed six new buildings, along with a relocated gas bar. The tallest buildings are 22 storeys (75 metres) and 10 storeys (35 metres) in height. A total of 440 residential units and approximately 135,000 square feet of commercial space were proposed. The land use amendment application (LOC2016-0326) was submitted to redesignate the property from C-C2 f2.0 h9 to a Direct Control designation that would be based on the C-C2 designation. The land use amendment was presented to Calgary Planning Commission (CPC) on November 16, 2017. CPC recommended the application for approval by City Council. The Dalhousie Co-op land use application was approved by Council on January 23, 2018. A concurrent development permit (DP2016-5075) was submitted with the land use application. The development permit application was presented to CPC on December 14, 2017 and was conditionally approved, dependent on Council's decision on the land use application. The development permit will be given final approval shortly, following Council's approval of the land use application on January 23, 2018. A building permit will have to be applied for before construction begins on the project. Note: It is Co-op's intent redevelop the site in phases, keeping the current Co-op store and existing businesses open until each replacement space is built. Co-op also intends to keep an adequate level of parking available for customer use during the construction period. The new Co-op grocery store is proposed to be approximately 51000 square feet, while the current store (with the attached bank) is approximately 52,510 square feet. What is happening to the existing liquor store, gas bar and bank? Are they closing? Like the grocery store, the bank, liquor store and gas bar are proposed to be relocated within the site, but will not cease operations. Each current business will continue to operate until a replacement is constructed. Yes, the development is proposed to incorporate several phases. The first phase involves the relocation of the liquor store and gas bar. Phase two involves the construction of a new Co-op grocery store and adjacent bank (the bank will open first). Phase three will see the new Co-op store open and demolition of the existing store. Construction will begin on two residential buildings, the parkade, commercial stores and offices in place of the existing Co-op. The new buildings incorporate a range of proposed heights. 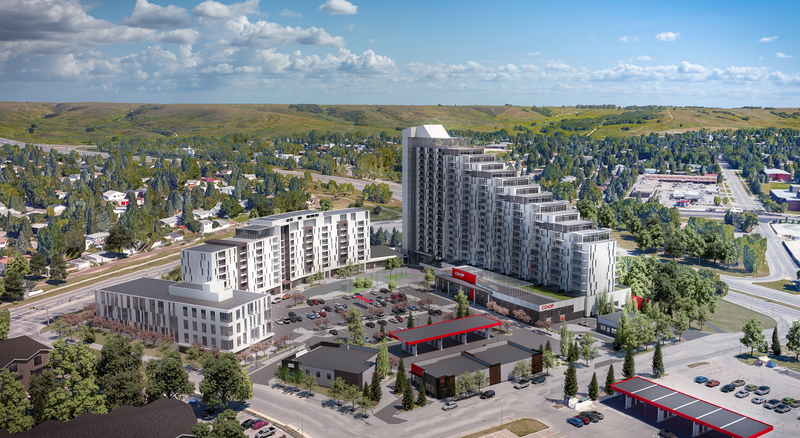 The tallest building is located above the new Co-op (located on the east boundary of the site) and proposed to have a maximum height of 22 storeys (75 metres), but will taper down in height to 7 storeys closer to the Canadian Tire site. The second tallest building is proposed to be 10 storeys (35 metres) and is located on the north portion of the site. The development is proposing a total of 440 residential units. Are there any details that can be shared about the residential component, such as what size the units will be? Will this be targeted for students, seniors, families or rentals? The residential units generally consist of one, two and three bedroom apartment suites. The majority of the units have two bedrooms or more. The target audiences are young professionals as well as seniors in the area looking to down size from their larger homes. A total of 746 stalls are provided on site. 156 stalls are provided on the surface for commercial parking, and 590 underground for residential, residential visitor, office and commercial parking. There are approximately 12 retail spaces within the development including the relocated bank and liquor store. Changes to the number of retail units may occur depending on the requirements of future commercial tenants. No changes to existing street parking are contemplated with this development. Has The City looked at imposing parking restrictions on nearby streets to limit spillover effects on residential areas? The City is not currently contemplating imposing parking restrictions on nearby streets. Will Co-op implement any parking restrictions on-site to ensure residents don't park in commercial spots? Co-op will monitor their parking lot to ensure commercial parking is used by commercial tenants and patrons. We have now completed our engagement for the Dalhousie Co-op redevelopment application and you can view the final engagement summary here. In August 2017, citizens were invited to provide feedback on a revised application for the Dalhousie Co-Op redevelopment. This feedback was used to inform the second detailed review of the application and was shared with the applicant. In May 2017, citizens were invited to participate in a visioning workshop. At these workshops, citizens completed a group exercise where a game board of the Dalhousie site was used, and participants were able to lay down tiles that represented the various uses (grocery store, residential space, parking, gas bar, offices, medical clinics, etc.) to demonstrate what layout they think works best for the site. In May 2017, citizens were invited to provide their feedback online and share their ideas and concerns about the project. This survey was available from May 15 – 25, 2017 online. The feedback received from this online survey was used to inform phase two of engagement and the first detailed review of the submission. A summary of feedback received and verbatim comments received during both phase one and two are within the What We Heard Report. Development Permit submission to The City. Currently under review.